SUBHEAD: No, it is not an old doo-wop group - it is evil incarnate. People designing robots to kill people. Image above: The once applied motto of Google "Don't Be Evil" seems to have been lost in a cloud of money. 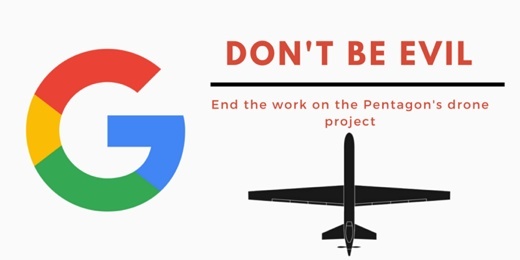 From (https://www.suasnews.com/2018/04/google-employees-petition-against-project-maven/). Project Maven will use machine learning to identify vehicles and other objects from drone footage - with the ultimate goal of enabling the automated detection and identification of objects in up to 38categories - including the ability to track individuals as they come and go from different locations. “If ethical action on the part of tech companies requires consideration of who might benefit from a technology and who might be harmed, then we can say with certainty that no topic deserves more sober reflection—no technology has higher stakes—than algorithms meant to target and kill at a distance and without public accountability,” the letter states.